“Icon of the Indecisive (Interim Goddess of Love #3)” is out! Yay! 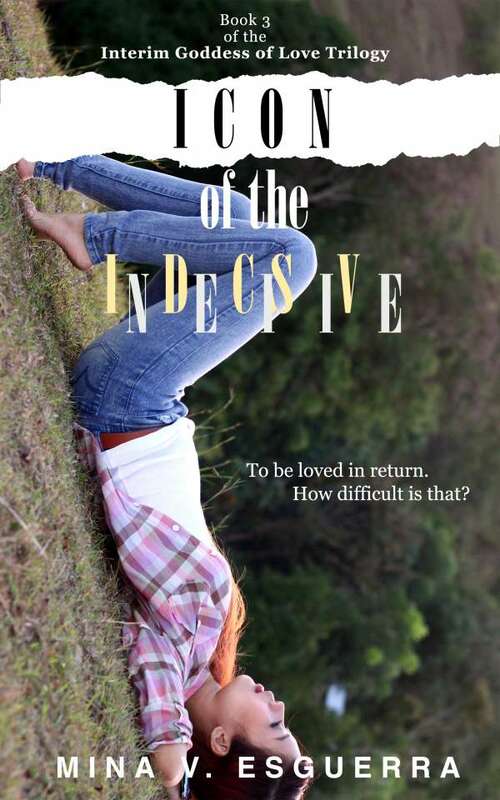 Mina V. Esguerra just released “Icon of the Indecisive”, the conclusion to her YA series “Interim Goddess of Love”! The e-book is now available on Amazon. College student Hannah Maquiling, also temporarily working as the Goddess of Love, has had enough of everyone asking for her help when it comes to relationships. It’s her turn to find romance! She deserves it, after serving as matchmaker and confidant to everyone else in Ford River College for the past year. She’s had a crush on handsome senior (and God of the Sun) Quin forever, but he’s destined to fall in love with an extraordinary mortal woman, so she’s figured her chances with him have pretty much dropped to zero. It’s not like she doesn’t have any options for a classic college romance though. There’s Diego, God of the Sea and Quin’s best friend/enemy. And regular guy Robbie is stepping up, making sure she knows how he feels about her. How hard can it be for a goddess to find someone to love, and be loved in return? I’m proud to be part of what Mina calls the “First Edition Club” who read “Interim Goddess of Love” when it was first released. I was also part of a small group of readers who read this last book before publication to record an audio commentary on the entire series. You can download the commentary from Mina’s website: click! I really enjoyed reading this trilogy. The romance is familiar (though some of the members of our usual “boyband” got seriously upgraded to deific proportions), but the incorporation of the Pinoy fantasy elements really made the stories something more than just your average teen love story. I love that it feels very contemporary (with a touch of the ancient in the “goddess dreams”) because our local myths are rarely appropriated in this manner, and I feel like this is a good way to get younger readers to explore those myths further and to make them relevant. I know this was not Mina’s intention—she really just wanted to experiment and expand her writing repertoire more—but I like to think this is a great fringe benefit. Mina also mentioned that the fantasy in this series is intentionally on the lighter side because this is still a romance more than anything. But despite not massively world-building, I think the world of IGoL and its fascinating characters is rich with potential to give birth to even more interesting stories. I also liked that while we’ll never become the Interim God/Goddess of Anything, Hannah’s troubles are still very real and easy to relate to despite being just a tad more fantastic. For details on how to purchase the books, visit Mina’s website: click! RE: Rooftop Prince –> yeah, that started out fun then got really stupid towards the end. I was only able to watch the whole thing because the actors were so entertaining.